The Don’t Wait to Anticoagulate project was run in partnership between Bristol, North Somerset and South Gloucestershire Clinical Commissioning Group (CCG) and the West of England Academic Health Sciences Network. The aim of the project was to reduce the number Atrial Fibrillation related strokes. The project ran from January 2017 until May 2017 and an evaluation has been undertaken - you can read about the results and conclusion below. One way of reducing strokes in people with AF is to prescribe an anticoagulant. 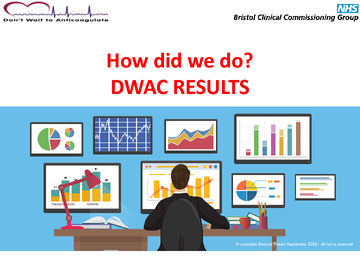 For this reason the DWAC project incentivised Bristol’s GP Practices to contact patients with a diagnosis of atrial fibrillation and were either not on an anticoagulant or were not stable on their medication to come in for a review. Participating Practices invited patients to discuss their risk of stroke and what could be done to reduce that risk. If the patient and their GP agreed that anticoagulation medication was in their best interests, the most appropriate anticoagulant was then prescribed. 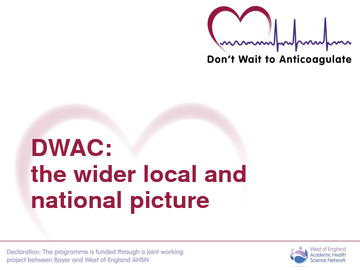 The DWAC Project supported primary care providers to improve anticoagulation management for AF patients through a range of supportive measures including Clinical Skills Training, Quality Improvement (Q.I.) Training and Support, Ongoing Clinical and Q.I. Expertise, Prescribing Incentive Scheme Incentivisation and Medicines Optimisation Pharmacist Support. 40 of the 47 practices in Bristol took part on the project, this covered 86% of Bristol’s population. 942 patients identified with AF who were at risk, but not anticoagulated (16% AF register). TTR (Time Therapeutic Range) less than 65% leads to both increased risk of stroke and increased risk of bleeding and death. Approximately 6 strokes prevented in one year. Resources can be found below and on REMEDY. Practices can also find a raft of excellent information and support tools on the WEAHSN’s Don’t Wait to Anticoagulate website. Presentation by Anna Burhouse, Director of Quality West of England Academic Health Science Network. 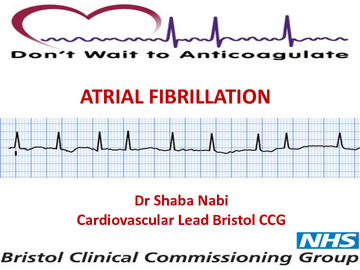 Presentation by Shaba Nabi, Cardiovascular Lead at Bristol CCG. Don’t Wait to Anticoagulate results: how did we do? Presentation by Kate Davis, Deputy Head of Medicines Management at Bristol CCG. 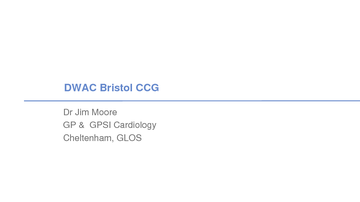 Presentation by Dr Jim Moore GP and GPSI Cardiology, Cheltenham.